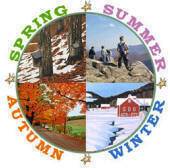 Vermont loves to host visitors and its towns welcome you to help add cheer to their winter celebration. For while winter is great and mighty the human soul is desperately in need of a boost during this season of cold, frost and quiet. A fun-filled winter carnival, offering ice carving exhibitions / competitions, zanysports events, kid-friendly activities, costume characters, and magic! The 6 to 10 day festival introduces has 21 events to assist the winter celebration. Before the carnival, area businesses create snow sculptures outside their establishments, to be judged on race day. The first winter carnival was held in 1921, and featured ski jumping and tobogganing on a hill behind the pubic school. It continued to grow, and by 1935 it included extremely competitive races in both alpine and cross-country skiing. Since its restoration in 1974 thousands have come to experience the fun of a New England Winter Carnival! WHEN: 2 days mid Feb.
A celebration of winter Snow and ice sculpture competitions, family activity expo, dogsled rides, snowshoe course, outdoor playground, entertainment. Getting There: Middlebury College Snow Bowl is located on Route 125 (off Route 7), about 30 miles south of Burlington and 30 miles north of Rutland, Vermont. A ten-day winter Carnival that capitalizes on Vermont's famous winter and combines small town fun with big city activity. Lots of food, skiing, snow shoe races, as well as the Jeep King of the mountain Downhill series. Woodstock is often called "the prettiest villages in America"; this quintessential New England Village and thriving Vermont resort community highlights its community spirit each December with the Wassail Celebration. The classic and spectacular parade of horses, riders, sleighs and carriages is the cornerstone of this annual weekend of memorable holiday activities for the entire family. Visit some of Woodstock's historic homes decorated for the holidays, Christmas Visions" - A Child's Magical Wonderland; Christmas at Billings Farm & Museum; visit with "Ghosts of Christmas Past" during historic walking tours of the village, and much more.